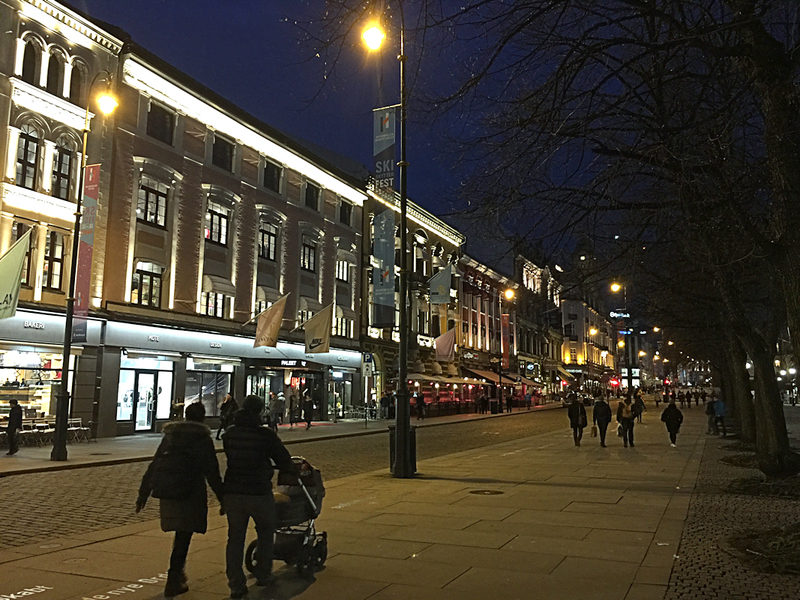 "Karl Johans Gate" the main street of Oslo used to be filled by pedestrians, cars and trams. The last years it have developed to more like a pedestrians street while cars and trams are no longer to be seen as before. This is around 5 o'clock PM a cold afternoon in March 2017 in the blue hour. Karl Johans Gate stretches from the central railway station to the Royal Palace. The street was laid at the Swedish-Norwegian King Charles Fourteenth Juhani, after whom later was named. It is famous for a lot of small shops and stalls of street vendors, art galleries open-air performances of musicians and actors directly on the pavement. Almost all the buildings on this street were built in the twenties and fifties of the nineteenth century by the court architect of the Norwegian Linstow, whose goal was to make the street, Karl Johans Gate in the "Champs Elysees" of Oslo. The most notable building in the street - the central building of the University of Oslo, built in the classical style by the renowned Berlin architect Karl Friedrich Schinkel.